The first step to creating an awesome startup is to create a landing page that converts visitors into users. Each of your landing page should have 1-2 call to actions. Call to actions are buttons or links that grab the visitor’s attention in less than 8 seconds and lead them to click on it. Tip to remember: All the most important information that will convert your users should be "above the fold" - which is the area that is displayed on the screen when loaded. This is the area that you need to utilize to capture your customers' attention within 8 seconds. UVP Message: This is your main message, and should be very visible on your website as a "hero unit". 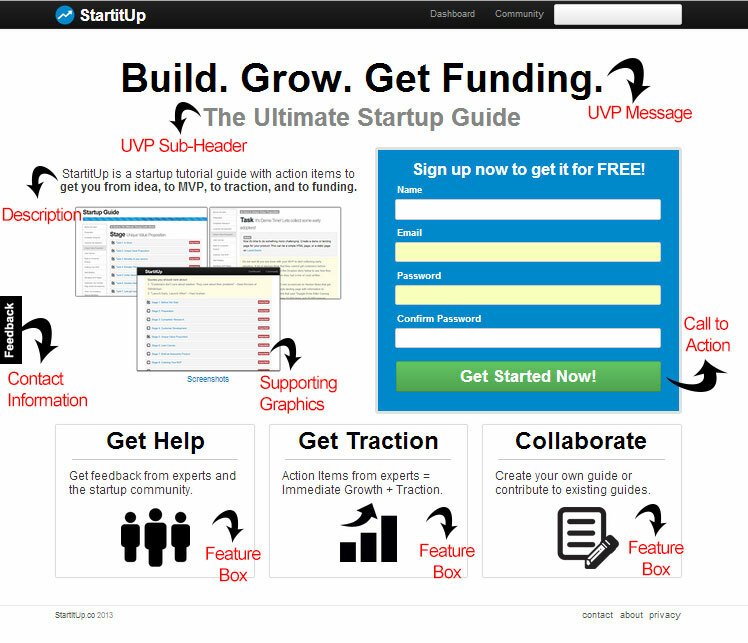 Get your UVP from this task. Sub-headlines: This strengthens your main message. It could be a secondary UVP, or just a better explanation of how your service works. Get it from your prior tasks. Description: This explains what your service does more in details - should be succinct and concise. Support your UVP with graphics – images, icons, screenshots, or videos. Feature Boxes with benefits that strengthens your UVP - benefits + descriptions + images. Get your benefits here. Call to action: Each page should have a purpose. Your call to action should let the user know what happens next, like "Get Started", or "Start Shopping"
Social Proof: This will help you a lot with your credibility. Add users' or experts' testimonials or recommendations. You can also add a section like "As Seen On" with logos. This will greatly help you with converting visitors into users. A good landing page with all the right ingredients can possibly convert 400%+ more signups than a bad landing page. Imagine the difference between 10% and 40% conversion rate...that's the difference between 1000 users and 4000 users! Successful companies never stop optimizing their landing pages. There is ALWAYS a better landing page that can help you convert more users. Notice how they have a great UVP headline, a sub-headline. They also have a simple supporting description on the left just above their screenshots. Their signup page on the right is just on the homepage, so that that decreases the friction of having to go to another page to sign up. 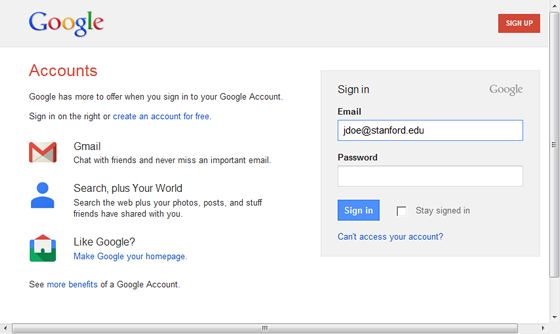 It also has a very strong call-to-action (Create a Free Account) that has a different button color (Contrast!) that stands out from the rest of the page (optimized conversion). I highly recommend Copy Hackers if you want to learn to write converting copies. Here's another beautiful landing page example by WealthFront.com. Call to actions (CTA) are buttons of links on your website that you want customers to click on to complete some kind of action. CTA itself is so important that it has become a study on its own. The reason why CTAs are so important because the goal of designing great landing pages is to convert visitors into users, and the pathway on your landing page that does that is CTAs. Therefore, it's very important to understand what kind of CTAs work and what kind of CTAs don't. Also, a detailed research on which colors conver the best tells us that there's no color that absolutely converts better than another color. The point here is to create contrast so that your CTAs stand out and users feel inclined to click on them. A good strategy to follow is to not use too many colors on your website, and always stay consistent with the color of your call-to-action. Case Study: Google always uses white as their background and 1 consistent purplish color for all of their links and most of their buttons. http://conversionxl.com/blog/ - awesome blog you should read to learn how to convert your visitors. Read-able.com: A tool that helps you analyze how readable your website is to your visitors and to search engines. Since a landing page is super important, we are creating a bonus section to help you optimize it.